Patricia Koski, associate dean for the Graduate School and International Education (center), presents Malachi Nicholas (left) and Edidiong Udofia with their Three Minute Thesis award certificates. Malachi Nichols won first place in last week’sThree Minute Thesis competition final with his presentation Beyond Smarts, the Role of Character Skills in College Success. 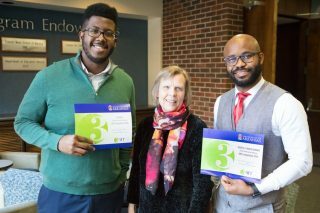 As the top finisher, Nichols won $750 and entry to the Conference of Southern Graduate Schools’regional Three Minute Thesis contest. In the regional contest, Nichols will represent the University of Arkansas while competing against nearly 50 graduate students from universities across the Southern Region. The contest will be held on Feb. 24 in Fayetteville. Nichols, who is advised by Gema Zamarro, is aneducation policy doctoral student. Members of the audience voted for Edidiong Udofia as the People’s Choice winner. Udofia, a mechanical engineering doctoral student, won $500 for his presentation Making Microdevices.Udofia is advised by Wenchao Zhou. Six contestants participated in the final. Each of the participants had previously won a competition held in the academic colleges that house their degree programs. The Three Minute Thesis contest challenges graduate students to summarize their thesis or dissertation research within three minutes to a general audience. Presenters were allowed a single, static PowerPoint slide to accompany their presentation. The contestants were judged on their ability to help audience members understand their research and their ability to engage the audience.